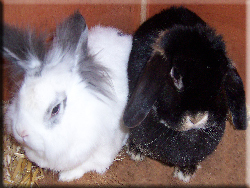 Many pet bunnies die each year simply because many people do not realize that rabbits cannot tolerate excessive heat. Rabbits cannot perspire and the only way that they can cool themselves is by their ears. To help keep your rabbit cool during the summer freeze a couple of gallon jugs of water in your freezer. Place one of the jugs inside the rabbit cage. A rabbit will usually lie against the jug to keep cool. A rabbit's teeth should be checked regularly to be certain that its not suffering from a condition called malocclusion which prevents it from eating normally. If a rabbit is suffering from malocclusion, the lower teeth slide over the top teeth and it is not capable of eating properly. The rabbit's teeth grow continuously, and malocclusion prevents them from being filed down through normal chewing. A bunny suffering from malocclusion must be taken to a veterinarian for the teeth to be properly trimmed. Nails on a rabbit should be routinely trimmed with a small dog nail clipper. As overgrown nails can give the rabbit discomfort. It would be wise to observe an experienced person perform this procedure before you attempt it if you have never clipped nails before. Care must be taken not to over-trim or cut into the blood vessel running through each nail.